He made a point of referring to the fight against the Islamic State as a “third World War” and called upon all nations to come together to help counter the threat posed by the militant group since they conquered large swathes of Iraq and Syria last year. “So this is our war. And we have a moral responsibility to reach out to those Muslims, to protect them, and to stop them before they reach our border,” King Abdullah said, speaking to CNN. The king did not advocate bombarding ISIS positions with nuclear missiles or thousands of tanks, but is advocating a united front, which would bring “Muslims, Christians and other religions together.” He stressed that the ideological element of the conflict will be the hardest element to solve. The US and its allies have ample ammunition to pound Islamic State forces for decades to come. Post by The Royal Hashemite Court. 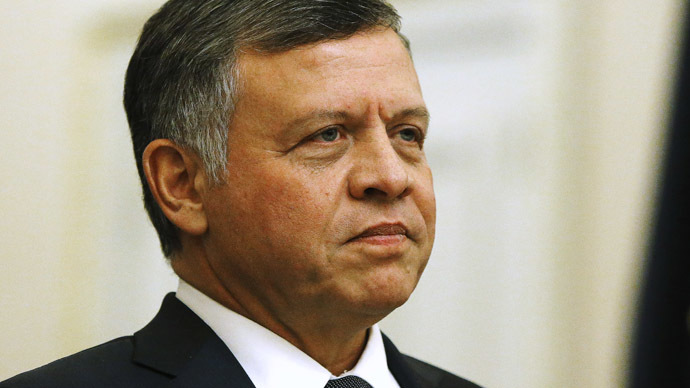 The Jordanian king has an ax to grind with the Islamic State. He watched his country mourn the horrific death of captured pilot Moath al-Kasasbeh, who was burnt alive by the Islamic State. However, rather than intimidating a nation of around 6.5 million, the actions undertaken by the group, formerly known as ISIS or ISIL, have had the opposite effect, the King believes. King Abdullah, dubbed the “warrior king” after 35 years of military service, pledged that the country would start playing a larger role in the US-led military collation. He even cut his visit to the US short in the wake of the pilot’s death and tried to rally a nation by appearing in military fatigues and black gloves in an Instagram photo, taken nine months ago. There have even been rumors that the king, a trained helicopter pilot, has taken part in air strikes against the Islamic State. The photo of the king amassed over 31,000 likes on Facebook. At a rally in the Jordanian capital, Amman, saw thousands take to the streets, shouting “We are all Mouath…we are all Jordan,” as well as “Death to Daesh” – an derogatory Arabic acronym for the terror group. From being an ally of the US fight against Islamic State with reservations six months ago, where according to a poll last September by the Centre for Strategic Studies at the University of Jordan, only 62% of Jordanians consider ISIS to be a terrorist organization, Jordan has now become among the most eager members of the anti-ISIS alliance. The country’s interior minister, Hussein al-Majali, has said that Jordan will “wipe [ISIS] out completely.” According to the Pentagon, Jordan dropped 72 bombs in the first wave of its revenge. Getting new ammunition should not be a problem. King Abdullah has managed to negotiate for Washington to commit to an increase in security aid from $660 million to $1 billion for 2015-2017. Despite being a key US ally in the Middle East, Jordan has not always been as ready to follow Washington’s lead. In September, Amman was concerned at US plans to arm and train more fighters of the Free Syrian Army, a supposedly moderate militant force fighting against the Syrian government. A report in the World News Daily, a US conservative news website stated a senior Jordanian security official as saying that Amman views the Syrian rebel group in its current state as ideologically close to extremists like the Al-Qaeda-linked Al-Nusra Front and the IS itself. Jordan has its own pressing claims regarding the Islamic State. Not only does the country share a border with both nations, it is also seeing a large number of disgruntled jihadists trying to return home, Reuters reports. Those who do return are often picked up at the border and sent for military trial. One source who is familiar with the policy of Jordan’s intelligence services, said: “We turned a blind eye to you going, but if you return, we will catch you and lock you up,” the source said, speaking about the case of a 23-year-old man who was trying to leave Syria, the news agency added. Around 2,000-2,500 Jordanians are known to have joined and are fighting for the Islamic State, The Guardian reported in February. This is the third largest foreign Arab contingent after Saudi Arabia and Tunisia. Many Jordanians seeing joining the Islamic State as a chance to move out of poverty.